Faribault may have a bit of a phenomenon on its hands. 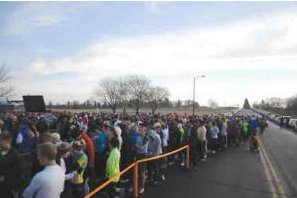 More than 1,000 people showed up at Faribault Middle School Thursday morning for the third annual Turkey Trot, a 5K run and walk to raise money for Infants Remembered In Silence (IRIS). Enthusiasm for the event was contagious as the gymnasium filled with people registering for the event. By 8:40 a.m., 17th Street Southwest was packed with people on a clear and - compared to the 2010 event - warm morning. "It's amazing, it's grown so much," said Sue Reuvers, a longtime organizer. She was clad in a mascot-sized turkey outfit and went by the moniker "Trot" for most of the morning. "I saw all the people and just got chills." IRIS is a local non-profit that provides support, education and resources to parents and families that experience the death of a child during pregnancy or during infancy. An event bringing awareness to such a tragic moment is expected to be sad - but there was no evidence of that Thursday morning. "It's all about the children, and there is grief," said Father Kevin Finnegan, who led a prayer before the race started. "But it's also about hope. You see the love these children have brought out in these families." Families and individuals that experienced loss were strengthened by the turnout, and forthright in sharing their stories. "It's important this keeps growing, and keeps bringing awareness to those children," said Ryan Halter, 41. He said his sister lost a child shortly after birth. "You can't help but be filled with hope when you see all these people turn out." Former WCCO news anchor Dennis Douda emceed the event. He was introduced to the cause by Turkey Trot Committee chairperson Deanna Kuennen, who herself experienced loss. "The cause is more than worthy, it's an incredible resource for the community," said Douda. "I plan on spending lots of time down here in Faribault." Runners of all ages, dogs, entire families and even horses attended the event. T-shirt making stations and other activities were spread across the school gymnasium. The viral nature of the event left many wondering how big it could get next year. "I was told by a friend who was told by a friend," said Lindsey Brooks, 27. "It's a great cause and it's hard not to tell everyone you know to show up." IRIS was founded in 1987 by Diana Sundwall after the full-term stillbirth of her son. The resources and support that she needed were not available - and IRIS was formed with the specific goal of assisting parents who experience the death of a child. The program has grown over the years and today offers many services only available through IRIS. IRIS provides services to six counties in southeastern Minnesota - Dodge, Le Sueur, Goodhue, Rice, Steele and Waseca. On average, nearly 7,000 people a year benefit from IRIS services, and for each child that dies IRIS spends approximately $450 in the first year following the death.